Here’s how to use your Affiliate Dashboard to promote Penguin Apps Builder platform. Well then check out this page to see exactly how you can use your Affiliate Dashboard to promote our platform and earn affiliate commissions for every sale you make. Well before you are able to access to Penguin Apps Builder’s Affiliate Dashboard, you will need to register first. After your registration of affiliate has been approved by the Admin of Penguin Apps Builder, which normally will be within a couple of working days. Remember to fill out all the details so it will help us to understand you more on how you going to promote Penguin Apps Builder. Once you are inside of your Dashboard, you will see some “big picture” stats on the main section of the page. Unpaid Referrals: Total numbers of unpaid referrals. Paid Referrals: Total numbers of paid referrals. Paid Earnings: Total commission has been paid (in dollars) generated by your hard work from your Affiliate links. Unpaid Earnings: Total outstanding commissions generated by your Affiliated link. Commission Rate: Commission rate of your Affiliate Link. Whoever you are promoting should have created a few links for you to promote. Scroll down on your dashboard to see the links that are available for you. Click on “Copy to clipboard”, will copy your Affiliate Link. Share your affiliate links with your audience, and watch your stats to see how many sales you generate. You may also have affiliate emails available for you as well. Emails allow you to copy & paste HTML code for a pre-written email that has your affiliate already copied into hyperlinked text, images, etc. in the body. Open an email, and click on the Copy button to copy the raw HTML code version of this email. Take that code and drop it into your email marketing tool like AWeber, MailChimp, ConvertKit, etc. Please direct any questions on how to copy in HTML code to your email marketing service. 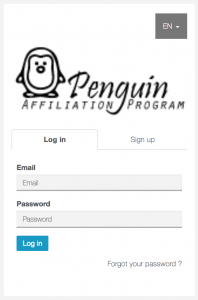 When your referrals are signing up in https://apps.penguinapps.biz, make sure your Affiliate Code in key-in. If you are using the affiliate link, your Affiliate Code will be pre-fill with the link provided. The Referrals is a running table of all activity that affects your commissions. When a new sales are made under your affiliate link, you will see a new line item in your Referrals. Each line item will show the amount, and the commission you earned from that amount. Items shown in parentheses are negative amounts that count against your commissions, representing refunds issued to the customer. The very top on your Affiliate Dashboard in Setting/Profile Page. Each time the account owner pays out a balance on your account, a line item will be updates into this referral page. Each line item will contain a total amount of commissions that were paid, and which referral is paid. Usually, Penguin Apps Builder Affiliate pays its affiliates through PayPal transfer. When you signed up to be an affiliate for this affiliate program, you will have to provided a PayPal address. If you ever want to see and/or edit which PayPal address you have on file, click on Settings in the menu at the top-right of your screen. If you have any questions about promoting, getting paid, etc. please contact the support team of Penguin Apps Builder. If there is anything we can help with here at Penguin Apps Builder, feel free to shoot us an email at affiliate@penguinapps.biz!